Hello, hello! 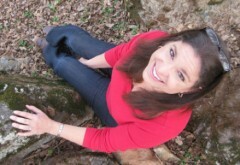 After a bit of a hiatus, I’m back recording podcast interviews with artists and crafters. On episode #130, I’ll introduce you to California garden writer and fiber enthusiast Chris McLaughlin. A long-time gardener, Chris loves to extract color from her plants and recently wrote a book about it so others can swan dive into the wonderful world of natural dying, too. 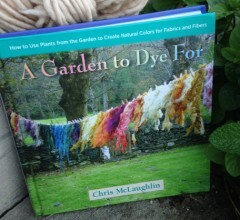 In her new book, “A Garden to Dye For: How to Use Plants from the Garden to Create Natural Colors for Fabrics and Fibers,” ($17.95, 142 pages) Chris profiles 50 plants to grow and harvest to dye fabric, yarn and Easter eggs and create a palette of natural watercolor paints. The book also includes directions for making eco-print scarves, too. 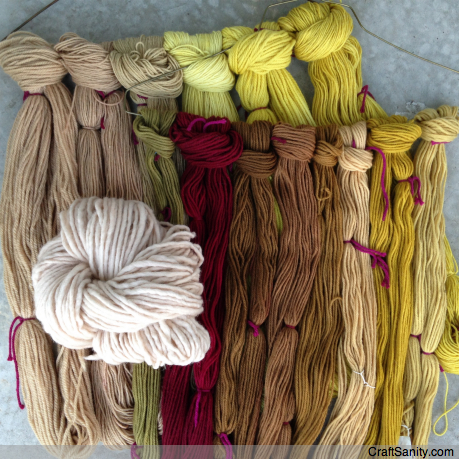 I just got serious about natural dyes last summer. So far, I’ve tried pokeberries, sumac, avocado, walnut, onion skins, rudbeckia (black-eyed Susan) and goldenrod. Once I get around to planting some Japanese indigo in my yard, I’ll finally be be able to dye my fiber and fabrics blue. That will be fun! So, pour yourself some tea, grab your latest project and settle in to listen to a fun chat with Chris. Then leave a comment below about your natural dyeing adventures. I’d love to hear about your experiments. You can find out more about the book here. And you can read the column I wrote about Chris on MLive.com. We are a group of volunteers and starting a new scheme in our community. Your site offered us with helpful info to paintings on. You’ve performed an impressive task and our entire community shall be thankful to you. hello there and thank you in your information – I have definitely picked up anything new from right here. I did then again experience several technical points the usage of this website, since I experienced to reload the site lots of occasions previous to I may get it to load properly. I were considering if your hosting is OK? Now not that I’m complaining, however sluggish loading circumstances times will very frequently affect your placement in google and can harm your high quality ranking if advertising with Adwords. Well I am adding this RSS to my email and could glance out for a lot extra of your respective exciting content. Make sure you replace this once more very soon..